Surgical errors in hospitals are legendary. Most of us have heard stories about surgical instruments, sponges, gauzes, needles and other surgical appliances left inside a patient. There are also reports of the wrong patient having been wheeled into the operating room or the wrong patient having the wrong limb removed or the wrong kidney operated on. Surgical errors are almost always out of the control of the patient. But, most surgical errors can and should be avoided. In one anecdote shared by a client, who was about to undergo a hip replacement surgery at teaching hospital in Chicago, the patient and client said that three separate nurses, a physician assistant and then an anesthesiologists stated to him that they were about to start his “right knee replacement” surgery. To the patient’s outrage who corrected each of them on what body part was to be replaced, the treating surgeon was summoned to him in the pre-operative area and advised about the mistakes and who then correctly operated on his hip not his right knee as some had said. Before undergoing surgery, patients are always encouraged to discuss the procedure thoroughly with the physicians and surgeons. Always discuss the part of the body to be operated on and the reason for it. Certainly include a thorough discussion on risks that are known for this type of surgery. In some surgeries, patients are conscious. The kind of anesthesiology may be an option that should be discussed with the physicians, surgeons and anesthesiologists. The Joint Commission has created a protocol for surgeons and other medical professions involved in surgery that requires the use of checklists and time-outs to confirm the right patient and the right body part. In order to establish medical or surgical negligence it must be proven to a preponderance of the evidence, more probably true than not true, that the surgeon acted below the standard of care. The usual and common definition of the medical standard of care is the type of care a reasonably prudent, reasonably trained health care professional would provide under the same or similar circumstances. The oath every doctor and surgeon take on being certified and licensed to practice medicine is “Do no harm,” which is The Hippocratic Oath. Even if the surgical error was below the standard of care as opined by a medical expert, the patient and lawyer must still prove that the error was the cause of the injury or death complained about. Many people call me and talk about the poor outcome or the need to repair a surgery that went terribly wrong. 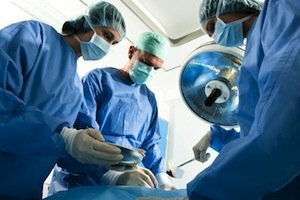 Often these patients have suffered because of the negligence of the surgeon, but when I ask the question without any intent to seem flippant, “How are you doing now?” and the answer is: “I’m doing fine,” there just wouldn’t necessarily be sufficient damages to bring a viable medical negligence case. Another important factor in reviewing surgical error cases is the consent form offered to the patient. It is imperative and required that each patient be explained by the surgeon as to all of the risks associated with the surgery they are about to undergo. Form consents are written usually by the hospital with the intent to disclose as many possible risks related to that particular surgery as possible to the patient in order to avoid a later lawsuit for negligence on the basis that the patient was not sufficiently warned of the risks. Surgeries come in many varied areas of medicine. No two surgeries are the same because each patient is different. Some surgeries are done to remove some foreign body or malignancy, such as a tumor to prevent its growth or spread. Some surgeries implant an organ or an artificial material like a stent or a hip joint or hardware to repair an injury leg or back. Surgical errors can be prevented. There are innumerable causes of surgical errors including poor communication among the medical team, unprepared physicians and staff for the unexpected, fatigue, improper operative suite conditions where infections are likely and just plain neglect. Also, patients may suffer injury or death because of surgical errors related to over-medication, operating on the wrong body part or even the wrong patient. Surgical errors leading to injury or death is devastating. It is critical that you have experienced lawyers on your side. With over 40 years of experience in handling surgical errors cases, the Chicago medical malpractice lawyers at Kreisman Law Offices have the know-how and resources to aggressively handle your medical negligence claim and obtain justice for you and your family. Contact our Chicago office at 312.346.0045 or 800.583.8002 or by email at bob@robertkreisman.com for an immediate free consultation, or fill out our contact form.